6:52 AM: Fire and police are headed for Beach Drive SW and Oregon, for a report of someone in the water, possibly face down, about 20 feet offshore. 7 AM: By all accounts (via scanner), this is confirmed to be a body, brought ashore, and most of the rescue response has been canceled. 7:06 AM: First evaluation is that this is a woman around 50 years old, per scanner. The Medical Examiner is on the way. Our crew should be arriving shortly to find out more. 7:15 AM: At the scene, we’ve learned the body was spotted by two people out for a walk. Police are declining comment, referring us to the media-relations unit. This all happened near the stairway that goes from the sidewalk down to the lower part of Emma Schmitz Overlook, across from Me-Kwa-Mooks Park. 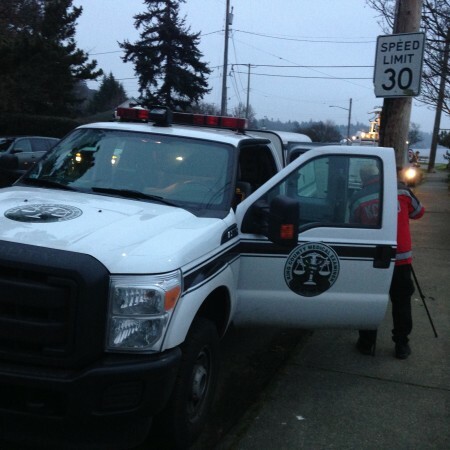 7:35 AM: An SPD spokesperson is apparently headed to the scene to talk with us and the TV crews that have arrived. As already noted in comments, if you’ve been here since at least 2012, you probably immediately recall the unsolved murder of 53-year-old Greggette Guy; her body was found in the water about half a mile north in March 2012, her car was found near where all this is unfolding today. But again, there’s NO information yet on how the woman found this morning died. We’ll update as soon as police have an official statement. 8:24 AM: SPD spokesperson Sgt. Sean Whitcomb has briefed us. This is NOT currently being investigated as a homicide and is (corrected) NOT considered a “suspicious death”; so SPD is investigating with the Medical Examiner, which has a crew on scene. The woman is believed to be in her 50s but that is just a guess so far – apparently no ID on her; they will be checking missing-persons records to try to find out who she is. Police are likely to be at the scene another hour or so, but the woman’s body will be taken away by the ME shortly. 11:20 AM: Above this line, we have added the video of Sgt. Whitcomb’s briefing, in its entirety. Questions were asked by the four crews who were there – ours, and three of the four local TV-news organizations. SPD Blotter has just published a post about this, but there’s no new information. ADDED FRIDAY, 5:29 PM: The King County Medical Examiner’s Office identifies the woman found off Emma Schmitz Overlook as 69-year-old Carolyn Arnold. According to the KCME’s afternoon media-hotline recording (a daily list of cases they investigate), the cause of Ms. Arnold’s death has not yet been determined, pending toxicology tests (which can take weeks). 50 Replies to "Update: Woman found dead in the water off Beach Drive SW; police are not investigating as a homicide, so far"
Wow! 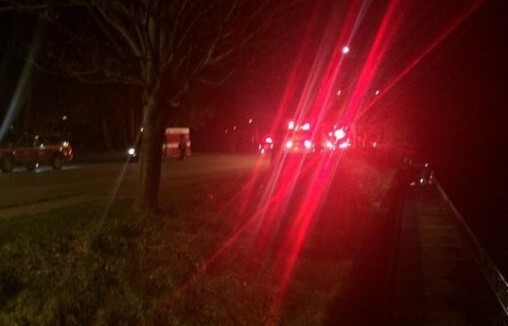 3 fire trucks and ambulance raced down Jacobsen towards Beach Drive. We assumed fire. Hope things turn out ok. I heard that she was wearing a flotation device, but can’t corroborate. This is so tragic, Im so sorry for all involved. Gregette was my first thought and I hope we can get answers sooner than later. In my heart, I don’t feel this is suicide. BT, *no*, no flotation device, per SPD. She was clothed, and wearing shoes (some of those clothes were removed by firefighters trying to see if she could be resuscitated) – her sneakers are what caught the eye of the men who saw the body and called 911 around 6:40. Police say they are NOT investigating this as a homicide at this point but as a “suspicious death”; they don’t yet know who she is. so sad, ran past there around 6 am and didn’t hear or see anything. Be safe out there! The fact these women were found almost 2 years apart makes me wonder…. Praying for this poor woman’s family that are looking for her right now. Hoping this is a accident rather than a murder :( Rest in peace…. Mmmbeach – 3 years, just for the record. 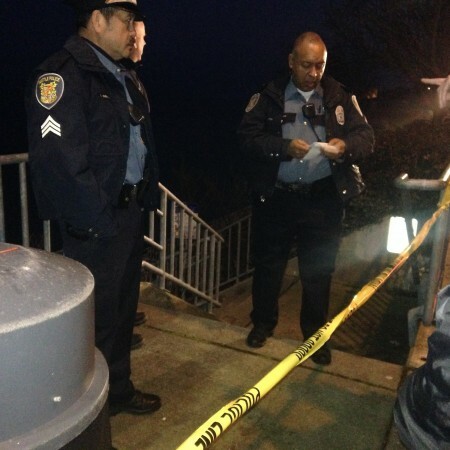 To be specific, March 12, 2012 – our initial report: https://westseattleblog.com/2012/03/body-in-the-water-off-beach-drive – That morning, SPD did dispatch homicide detectives, and this morning they did not see reason to. The death is of course tragic no matter what the cause/circumstances. What sad news. We wondered as we drove across the bridge this morning and medic and fire units were racing the other way, toward WS, what was happening. My thoughts are with families, friends and loved ones who will be getting devastating news today. I’m pretty tough but the news is seriously getting to me this week. We walk by there all the time. Feeling deeply sad now. That’s also the area where a couple sitting on a bench were shot years ago. I believe the young woman died. The family and friends of this woman should be foremost in our thoughts. If this is a local woman, they may very well be reading this not knowing anything more than these comments. So, until SPD and the Medical Examiner disclose FACTS, let’s remember who might be reading. Yesterday around 6:00pm I saw two police boats north of Duwamish head who appeared to be searching for a man overboard. They were firing many illumination flares, anyway. I’m curious if this is related. My sincere condolences to the family and friends of the woman. I was the one who called 911. I have been going down to the beach every weekday for about 10 years to have my coffee, read the paper, and do the New York Times crossword. It is generally relaxing and there are many people I see almost every day–joggers, walkers, and dog walkers and many times we exchange nods or greetings. Today one of the “regulars” came up to me and asked if I would go look at what he thought might be a body in the water. In the dark we made out a shape with bright white shoes floating face down in the water about 15 feet offshore. I called 911 on my cell and a police officer was there within minutes and I could hear the sirens of a huge response and even received a call from the Coast Guard to see if they were needed. The recovery by SFD was quick and efficient. I can shed no light on what have might happened as it seemed to be a normal day. I should add that Patrick was there very quickly. That lower walkway has unfortunately become the scene for far too many tragedies. You can add attempted suicides to the other events listed above. Most recent was in October 2011. Beach Drive neighbors worked to get the area lit with LED streetlights after the 2012 incident but now neighbors are reporting that “tagging” has really picked up. The parks department can hardly keep up with painting over all the graffiti. Sure, dead people show up on the beach all the time. Nothing suspicious or even odd about that. Why did you even call us? By “suspicious” that would mean an obvious reason to suspect foul play. We eventually learned, for example, that Greggette Guy had visible wounds that raised suspicions immediately, and Homicide was called to that scene. @old timer – not sure if you’re being sarcastic or what but if not then I’m really not sure why you’re even posting. Just seems like a misguided attempt if you ask me. I’m pretty sure everyone understands what WSB means by “suspicious death”, and are not taking it to mean anything else than just that. Maybe I’m reading too much into it but perhaps these types of comments would be better suited for a social network of some type then a legitimate blog such as WSB who do wonderful work for our community day after day. Just saying…. My thoughts go out to the victim and her family/friends. I too think about Ms. Guy frequently, and Mr. Jeffries. You correct to both being “NOT”… I don’t understand – if it’s neither a homicide or suspicious death, what is it, a suicide? So sad. My condolences to her family and friends. I too think of Gregette Guy. My husband and I were walking our then young Tibetan Mastiffs down by Me Kwa Mooks park the evening of her murder. We may have even seen her murderer. Twice I have provided info to SPD with no feedback, at one stage I was told that they wanted me to work with a forensic artist. Sadly, it never happened despite many attempts to discover how come this was never followed through on SPD’s side. Later during a home visit by SPD when my sons Acura was stolen I asked them again about Gregette Guy and told them how it haunted me still. I was again interviewed, same detective I believe… and again nothing. I hope this was not a homicide. I wish her family comfort and prayers. Seattle needs more police, they are stretched so thin, I think that this summer I was told that the numbers of the SPD are the same as they were in the 1970’s. Hopefully this can be remedied. Grateful for your presence and hand work. So sorry about this situation no matter what the explanation. But the location is still creepy to us who live in the neighborhood. I used to walk my dog down those steps and along the low walkway a lot. Until one day I got followed in the middle of the day by some guy who was also walking alone. Unfortunately, there was no way out for me. I had to walk all the way to the steps at the end of the path. I got out of there as fast as I could. He may have been up to nothing or no good. But I learned how vulnerable I was down there. I haven’t walked there since. That was close to ten years ago. WSGAL: If not homicide and not suicide, perhaps someone who fell ill onshore at water’s edge (stroke, fainted, etc.) and ended up in the water. You can drown in a few inches of water. Per above reports, the body was seen only about 15 feet offshore. Let’s not make any assumptions until the investigation is done. And I second the suggestion to remember she may have family members reading these comments. RIP. No reports of a missing mariner/paddler/windsurfer either, but the report of a SAR mission near Duwamish Head is a lead. Still, current patterns would not suggest that route for a floating object, knowwhatImean? Bottom line: this thing smells, and I hope SPD works all the angles rather than just try to close the case. Question: do vagrants still hang out in the uplands above M-K-M park, or was that pretty much put to bed after the G. Guy murder? There was no indication that the mentioned incident was search-and-rescue. There are frequent training sightings off there – we know, we frequently get reports of blue lights spotted, and then by the time we drive over, they’re headed back downtown, and we find out it was anything from a training mission to an investigation of an odd light in the water (that really happened last fall). Last night, we got one report of boats sighted, and before we could even tie our shoes to run out the door and look, a second person said the lights all headed back downtown. The sighting of police boats off Duwamish Head likely was not a S&R because there is no indication of a water rescue on the 911 log. I agree with TheShadow, there are only few scenarios that this is not a suspicious death. Detectives may be keeping details intentionally close to their chest for a few days, or they knew right away who this person was and knew the backstory, such as probable suicide. @WSB If this was a suicide or another non-foul play scenario, are we likely to ever know that? Or will this just fade away as a story? Gabby, we’ll continue to ask, though information procurement continues to have its challenges. If it was a suicide, this is probably going to be the last you’ll hear of it. Nothing sinister intended; the local media generally doesn’t report suicides in order to not inspire others who may be similarly hurting to actually go out and do it. There was nothing in the Seattle Times about it today, so it may well have been a sad case of someone taking their own life. Shadow, (a) WSB *is* the local media and we do follow up on suicides that happen to come to public attention. What you cite is a **myth** – merely reporting that a suicide happened does NOT inspire others. What the American Foundation for Suicide Prevention and other organizations warn journalists is not to glamorize or dwell on the method and other aspects. It is actually extremely unfortunate that my former colleagues in legacy media tend to cleave to that long-debunked taboo and therefore act as if the word suicide is radioactive. As reported here many times before, the suicide rate is much higher than the homicide rate here and in many other places, and talking about it, and offering resources, is the only way to even try to deal with that. Thank you, WSB, for staying on this. We neighbors really do care what happens on our watch. The woman’s name is known and the family has been notified. I think they haven’t published yet as something to do with the family wishes. Not sure. Her family is obviously devastated. And thank you so much WSB for continuing to report on suicides and not sweep them under the rug. They are a huge problem in this area, especially in the past year. I hate when they are ignored and brushed off. Not that this is necessarily what happened to this woman. May she rest in peace, and my thoughts are with her family. Thank you everyone who posted thoughtfully and expressed loving care! In pain and anguish I’ve been following you since last night hoping to find out what really happened to my best friend. Thank you garybert for your help in calling 911, rescue personnel for all your efforts and everyone for your loving thoughts and prayers! Thank you WSB for all you do! As long as I’ve known my dear friend (which was not long enough), she was loving, kind, always helpful, reaching out to others, taking care of others before she would take care of herself. She deeply loved her family and never knew a stranger only friends whom she had not met yet. Still can’t believe I’ll never again see her this side of heaven. Yes, she was a genuine Christian, walking in His footsteps with courage and love and also deep pain. SJ2 I agree with you, more needs to be done to help people in despair. Thank you also for respecting the privacy of her family! You are a caring community! She was a wonderful person. I knew her all my life – grew up with her kids. It’s terrible and sad. Ursula and Sdc, condolences to you and all others that knew and loved Ms Arnold…. My condolences to ms. Arnold’s family and friends. This woman is my mom. We believe she may have suffered a heart attack or stroke. Her health was poor. She walked that part of the beach often as it was a place of comfort for her. She was afraid of water and couldn’t swim. This is a mystery we may never have answers to but it does not change who she was and the love and grief of all who knew her. My mom was the best mom and grandma and great grandma I could have asked for. She was the most selfless person I know and she cared for everyone else before herself. She loved art and history,reading, writing,travel,and nature. Her life was too full and too amazing to fit in this comment. Just know that we lost a wonderful woman who just reached a heaven she longed for. I love you and miss you very much mom. Judi, I’m so sorry for your loss. Thoughts are with you and your family.